It is the most common food allergy in the UK affecting 1 in 50 children and usually begins in the first three months of life. Immediate reactions. Fifty percent have symptoms that begin straight away. These include hives / “nettle” rash, swelling of the lips and itching. Some children have an itchy throat, others feel sick, vomit or have diarrhoea. Severe reactions (anaphylaxis) are much less common, but include difficulty breathing (with wheeze or swelling that blocks the mouth or throat), feeling faint or dizzy. Delayed reactions These can occur hours or sometimes a day or two after eating the food. Common symptoms are flares of eczema, vomiting after feeds, colic, diarrhoea sometimes with blood in the stools. This is not an allergy but an inability of the gut to breakdown milk sugar (lactose). It causes watery diarrhoea, flatulence and / or stomach cramps. This usually follows a bout of gastroenteritis and gets better when the tummy upset resolves. How serious is cow’s milk allergy? Most children only have mild reactions. Severe reactions are uncommon but need urgent medical attention. Milk proteins are affected by heat. Cooking changes the protein in milk and makes it less likely to cause allergic reactions. 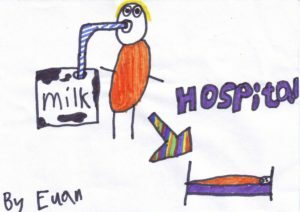 For example although a child may get an itchy rash or swelling if they drink milk, they can often tolerate milk baked into digestive biscuits. Are children likely to be allergic to other foods? Children with cow’s milk allergy are very likely to be allergic to goat’s and sheep’s milk. A smaller number of children will also have a soya milk allergy. If your baby is formula feeding it is advisable to switch to a low allergy “extensively hydrolysed” formula. Examples are Althera, Aptamil pepti, Nutramigen LLG and Similac alimentum. A soya protein-based formula is not recommended in infants under 6 months but may be tried in older children. How do we diagnose cow’s milk allergy? The diagnosis is usually based on a history of a typical reaction. If the reaction is immediate skin prick tests or specific IgE blood tests can be helpful. Allergy tests are not helpful in the diagnosis of delayed allergic reactions. What dairy products should my child avoid? Cooking changes the protein in milk and makes it less likely to cause allergic reactions. For example, although a child may get an itchy rash or swelling if they drink milk, 75% of children will tolerate milk baked in digestive biscuits. If the child tolerates digestive biscuits, they can continue to consume milk in this form. Children allergic to cow’s milk should avoid full fat, semi-skimmed, skimmed, sterilised, evaporated and condensed is necessary. Because of the potential for nutritional deficiencies, particularly in young infants, advice from a paediatric dietitian is recommended. A dietitian can advise on a suitable replacement formula and alternative sources of calcium and other vital nutrients for your child and mother if breast feeding. They can also provide advice on increasing the amount of baked or processed milk products (milk ladder). This will help your child outgrow their milk allergy more quickly. What can I do if my child has a reaction? A written management plan will be given in clinic and the advice should be followed. Allergy medication should be available at all times. If a child with a history of immedate reaction to milk accidentally eats food containing milk tell them to spit the food out straight away and give them their antihistamine. Delayed reaction although sometimes troublesome, rarely cause life-threatening symptoms and the mainstay of treatment is avoidance. It is important to inform the nursery/school and any after-school clubs. Any other carers such as grandparents, relatives and school friends’ parents will also need to know. How do I know when my child has outgrown their cow’s milk allergy? 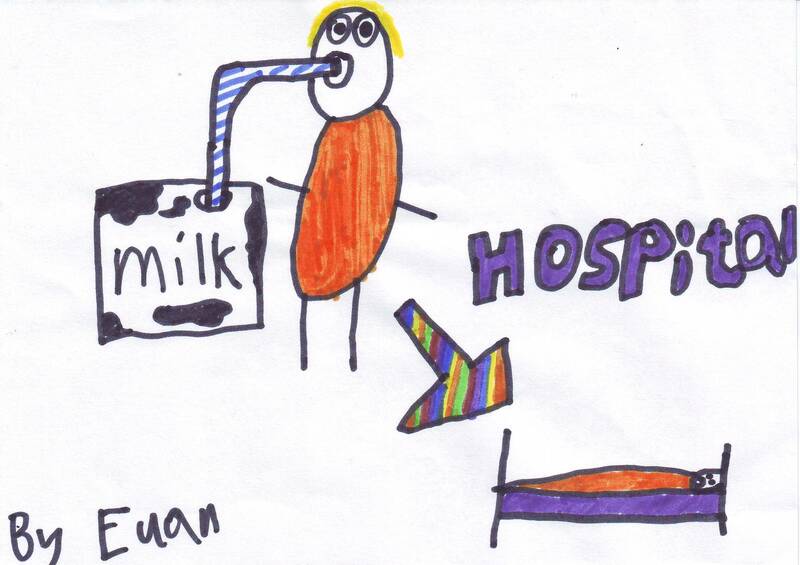 Four out of five children outgrow their milk allergy by school age and therefore patients should be reviewed every 6 – 12 months regarding the need to continue to avoid cow’s milk. Click on the icon to review our guidelines for home milk challenge.